Astrological Calendars differ from the common sort. Astrological calendars not only give the moon's phase, but also its void of course & the aspects it makes to the sun & other planets, and the aspects sun & planets make to each other. Astrological calendars also tell when the moon, sun & planets enter each of the 12 signs of the zodiac, when planets station & go retrograde/direct, as well as note solar/lunar eclipses & lunar occultations. All precisely timed. A regular calendar will tell you the day of the week. An astrological calendar brings you the world, if you know how to read it. If you're new to the insane world of astrological calendars, know that most people wait for Jim Maynard's wall, datebook & pocket calendars, which, most years, arrive in early November. By "most people", I mean 90% of us, me included. They're that good. In years past I waited until stock actually arrived, or was due to arrive in a week or two, and only then put them on-line & started taking orders, but in 2008, for the first time, I opened the listings & started taking orders on Labor Day, in September. This worked rather well, and I have done the same every year since. The following interior scans are 100% LIFE SIZE, though your monitor may show differently. Cover illustrations are at 25%. 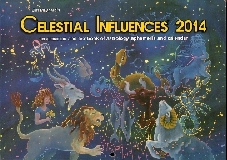 Jim Maynard's Celestial Influence Wall Calendars for 2014. Choice of Eastern or Pacific time. Your daily guide to what's up in the heavens, timed to the minute, in your choice of EASTERN or PACIFIC times, using Standard time in the winter & Daylight in the summer. Of the many astrological calendars, this has long been our personal favorite. Read the complete list of contents here. Size (open): 12 inches horizontal, 18 inches vertical, or 30.5 cm horizontal, 46 cm vertical. Published by Quicksilver Productions, printed in China. 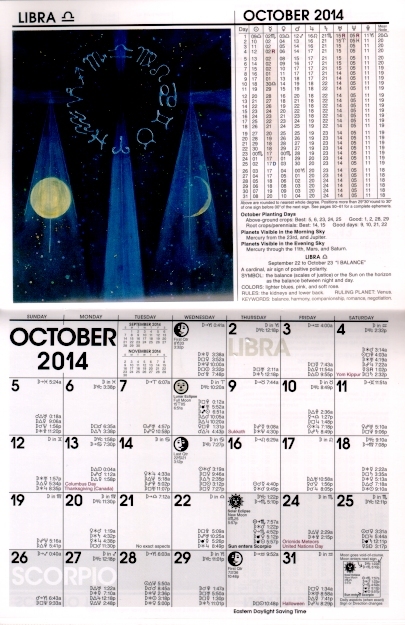 Jim Maynard's Celestial Guide 2014, An Astrological Week-at-a-Glance Engagement Calendar. 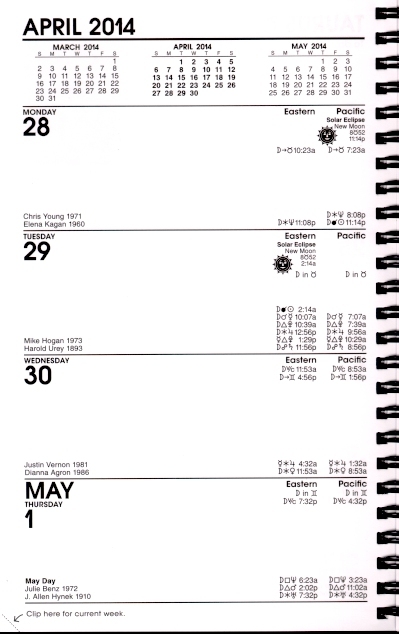 Overview: Maynard's datebook shows both EASTERN & PACIFIC times. STANDARD time is used during the winter months, DAYLIGHT is used in summer, so there's never a need to fiddle with times. Individual days show the same data as the Maynard wall calendar,eg, date, day of the week, lunar sign, void of course/entry into sign, aspects, birthdays. Left-Hand (even-numbered) pages: At the top, the month & year. Under that, small calendars for the previous month, the current month, and the next month. Below that, space for Monday through Thursday. Right-Hand (odd numbered) pages: At the top, the sign of the Zodiac for the week, a space for TO DO notes, a small B&W reproduction of the art for the month (from the wall calendar), and Thursday through Sunday. Wirebound (very convenient). Size: 5.35 x 8.5 inches, or 13.5 x 21.7 cm. Quicksilver Productions, printed in China. 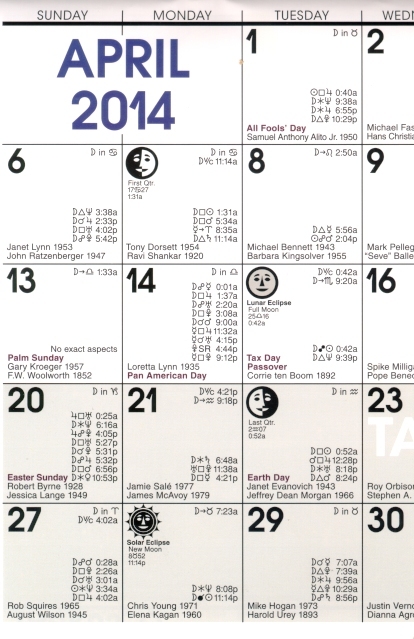 Jim Maynard's Astrologer's Datebook 2014, An Astrological Week-at-a-Glance Engagement Calendar. Overview: Maynard's pocket-sized datebook shows both EASTERN & PACIFIC times. STANDARD time is used during the winter months, DAYLIGHT is used in summer, so there's never a need to fiddle with times. 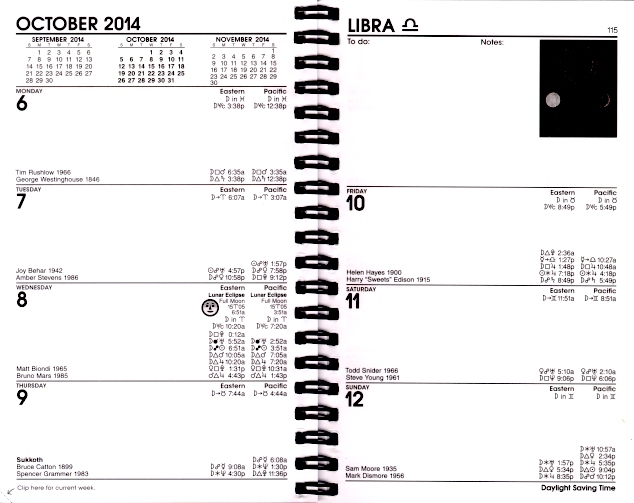 This is PAGE FOR PAGE identical to their larger datebook (shown above), but slightly smaller. This is now wirebound, just like its big brother, the Celestial Guide. Carry it with you: A good size for a purse, or will fit in a man's jacket or pants pocket. Size: 4.25 x 6.75 inches, or 108 x 171 mm. Jim Maynard's Pocket Astrologer 2014. The calendar pages in Maynard's Pocket Astrologer are an exact duplication of the wall calendar, but very much smaller. Please see notes above for a description. As with Maynard's wall calendar, both STANDARD & DAYLIGHT times are used. As the printing is very tiny, I've always found the type too small to read, but Maynard's Pockets are quite popular. So it might just be my eyes (they're not what they used to be). Size (closed): 4.25 x 5.5 inches, or 11.7 x 14 cm. Quicksilver Productions, printed in China. 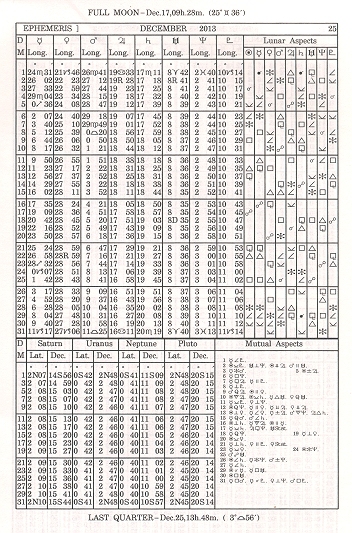 The original, classic annual ephemeris. For 2014, set for the traditional NOON GMT. Includes planetary longitudes, latitudes & declinations. 48 pages. Size: 5.15 x 7.75 inches, or 13 x 19.8 cm. Published by Foulsham & Co. Ltd. If this is the only item on your order, we will ship First Class at reduced rates. 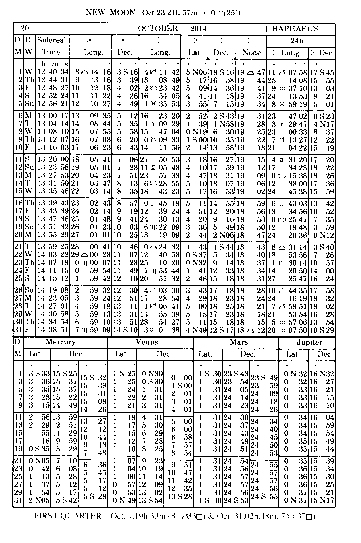 The original, classic annual ephemeris. For 2013, set for the traditional NOON GMT. Includes planetary longitudes, latitudes & declinations. Set for noon GMT & with the traditional Rosicrucian planetary order: Sun, Venus, Mercury, Moon, Saturn, Jupiter, Mars, Uranus, Neptune, Pluto, true Node. Includes declination, eclipses, lunar phases, lunar last aspect & ingress (eg, void of course), Julian day, SVP, ayanamsa, ecliptic obl., nutation. In the back is a full aspectarian & logs. Traditionally issued without a cover. Size: 5.6 x 8.4 inches, or 14.1 x 21.3 cm. I have always liked the "new" Rosicrucian layout (it came out of Paris 25-ish years ago). I especially like the new & full moons at the top of the page. It makes finding eclipses a snap. New for 2014: For the two copies I have seen thus far, notably cruder printing. 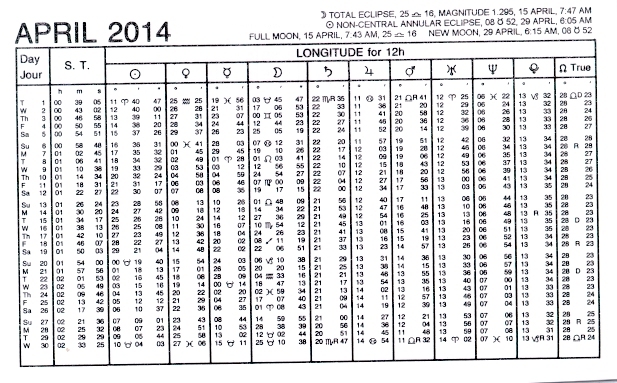 On the front cover, a thin line through the word Ephemeris at the very top. It looks like someone accidentally dragged a pen across it, but if you look closely, you will see they were all printed that way. Inside, a lot of the pages are skewed, which is to say, not square. (See illustration, which was the best I could do.) The calculations are still first rate and highly accurate as they were done years ago by computer and are merely copied. The poor condition is presumably because of ongoing economic distress. Please accept my apologies. Other astrological calendars & annuals come to our attention from time to time. Typically we are notified of a new product in October or November, which gives us little time to design a layout & generate sales for it. Worse, many of these disappear after a single year. For those who may publish such things & who may chance upon these notes: There is a reason Maynard is no. 1 in astrological calendars. In sales he is far and away ahead of all the rest. This is not only because he has the most outstanding product, but also because he has published it for well over 30 years. Quality, combined with persistence & hard work, have given him this great prize. So if you have published something new, something you know to be good & useful, remember that persistence is the key.